Yard dumpster rentals are here to change the way you look at yard work. It’s one of the most dreaded aspects of the autumnal season – leaves blanketing your once-healthy lawn, hours of endless raking, and trying to prepare your beloved garden plants to survive the crushing cold of winter. You can practically feel the stress breathing down your neck at the prospect of countless weekends hijacked by boring lists of yard work chores. But yard dumpster rentals let you get more done in one day than you ever thought possible. Doing yard work is tedious enough without having to stop along the way and bag up the debris as you go. When you get to the end of a long day toiling (and missing important football games) you want to at least look out over your lawn and see a picture perfect image. That can’t happen if you are constantly making stops in your work to bag up the trash and set it at the end of the driveway. Throw your yard waste into the dumpster, cleaning as you work, so that you have the reward of a job well done at the end of your afternoon. One of the most depressing sights after a long day of working in the yard is the hideous row of black trash bags and/or piles of large debris that must sit and wait for the garbage pickup to be cleared away. A sloppy end to the immaculate efforts of the day you spent raking and mowing and trimming and edging! Maybe you have the luxury of a backyard to stash this mess, but most people don’t. And who wants to haul all this around the side of the house? Dumpster rentals eliminate this problem. Pick the exact time you want your dumpster hauled away and the trash experts will make it so. 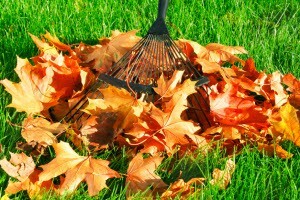 No homeowner can escape the reality of yard work in the fall. The leaves are changing, and falling, and crunching pleasantly underfoot. But there comes a time when the picturesque doesn’t outweigh the fact that your yard is a mess! If you and a couple neighbors are willing to schedule a cleanup day, you can split the cost of the dumpster and make an event out of the chores. Have something more serious in mind than your run-of-the-mill fall weekend cleanup? If so, you should definitely consider a dumpster rental for quick and convenient debris disposal. Tree stumps, uprooted bushes, and major landscaping debris can all fit neatly into a personal dumpster rental. Fall cleanup can be pretty brutal in some areas, and if you have some bigger projects planned before winter makes yard work impossible, it’s a good idea to get them planned with a yard cleanup dumpster rental. Call 678-807-9328 to get more information about yard dumpster rentals.